Thinking about risk reducing breast surgery? Managing your risk of Ovarian Cancer? Men & BRCA Genes: What do they need to know? We all feel fatigue at times – maybe when we are working too hard, worrying about something or just doing too much partying! Fatigue for people with cancer can be very different. The cancer or its treatment may make you feel very tired. It can go on for weeks, months or even years after you finish treatment. This is called chronic fatigue, which means long lasting. Most people get back to their normal energy levels from between 6 months to a year after the end of cancer treatment. But it can take longer. Most people feel tired while they are having radiotherapy, particularly if they are having treatment over several weeks. This is because the body is repairing the damage to healthy cells, or tiredness can be due to low levels of red blood cells (anaemia). You may also feel weak and as though you don’t have the energy to do your normal daily activities. This may last for a few weeks after the treatment ends. Rest if you need to and try to exercise a little when you can. This may help to reduce the tiredness. Fatigue is very common in people with cancer. It can be the most troubling symptom. It affects between 7 and 9 out of every 10 people (70 to 90%). Many people with cancer say that it is the most disruptive side effect of all. In the past, doctors and nurses haven’t always appreciated the long-term effects of fatigue on people with cancer. But there is now a lot of research into this area. Things are improving and there are ways of relieving fatigue. You are not imagining your cancer fatigue. It is very real and can have a big impact on your life. If you have symptoms of fatigue, let your doctor or nurse know. There are ways of managing fatigue and your medical team will try to help you. You can do many things in your everyday life that will help to save your energy. Taking short cuts on some things or getting help from other people may help you feel less tired. Try not to rush – plan ahead where possible. Allow plenty of time for travel, and avoid the rush hour if possible. Put chairs around the house so that you can easily stop and rest if you need to. Sit down to dry off after your bath or shower, or simply put on a towelling dressing gown and let that do the work. Have some hand rails fitted in your bathroom to hold on to when you get in and out of the shower or bath (the hospital can help to arrange this for you). Prepare your clothes and lay them out in one place before you dress. Get dressed sitting down, as far as you can. Try not to bend too much – rest your foot on your knee to put socks and shoes on. Fasten your bra at the front first and then turn it to the back. Wear loose fitting clothes, and things with few buttons to do up. Where possible do household tasks sitting down – for example, peeling vegetables or washing up. You can also do ironing sitting down or buy clothes that don’t need ironing. Use a duster on a long stick and sit to do dusting. Write a shopping list and go when the shops are quiet; or do your grocery shopping online. If you have children, play games that you can do sitting or lying down – reading, puzzles, board games or drawing. Ask family and friends for help with shopping, housework or collecting the children from school. Have plenty of nutritious snacks and drinks in, so you can have something quickly and easily whenever you feel like eating. Don’t forget to do things that you enjoy – it will take your mind off your cancer and make you feel more relaxed. If you would like further advice about managing your side effects, speak to your medical team or contact your local cancer support centre. You can find a list of cancer support centres here. 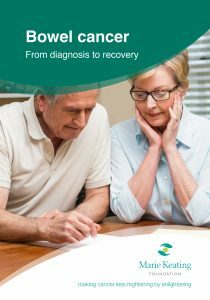 You can also download a copy of the free booklet, ‘Bowel Cancer: From diagnosis to recovery‘ here. We hope you found this information useful. The Marie Keating Foundation offers all our services for free. To help the fight against cancer, please donate now. Have a question about any type of cancer? Ask an MKF nurse using our free, confidential service. Your donation will help us reach more people with the life-saving message about cancer prevention and awareness.